SOUTH BEND – Notre Dame is 2-0. That's the most important statistic following the Irish's 24-16 win over Ball State in front of a soggy crowd at Notre Dame Stadium on Saturday. It's more important than Brandon Wimbush's three interceptions and more important than the eight-point margin of victory. Brian Kelly channeled Al Davis after the game. His message: Just win, baby. 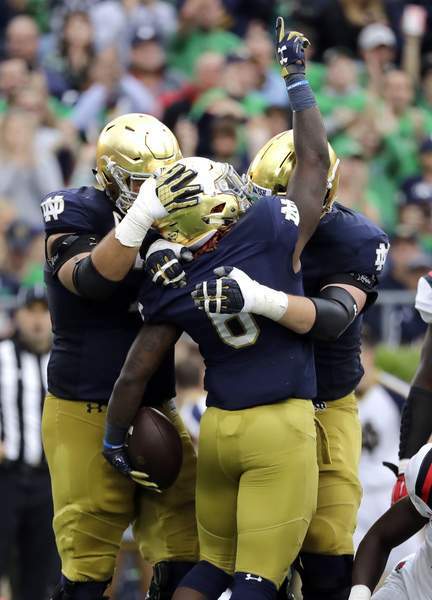 Yes, the Irish played an ugly game, far below the standard they set for themselves after their Week 1 victory over Michigan, but they were able to pull out a victory anyway, despite not bringing the kind of energy they expect from themselves. "I don't think my perception of our team changes (after this game)," Drue Tranquill said. "If you look at the set of data I have to look from, it's eight or nine months of training. I've seen these guys work. To come out here and have one day where guys maybe weren't on their Ps and Qs, we lacked energy, we didn't pay attention to our traits. I don't assess as, 'Oh, we're here, oh we're there', based on one game." 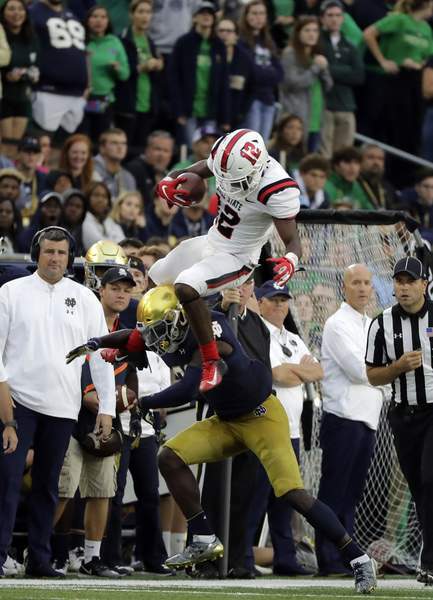 Still, it's hard to ignore some of the deficiencies the Irish displayed against a Cardinals team that came in and played extremely hard and extremely well. The Notre Dame offensive line especially was inconsistent and often didn't give quarterback Brandon Wimbush much time to throw. Ball State was very good at keeping Wimbush in the pocket and not letting him escape to run (he finished with negative-11 yards rushing) and he took a number of big hits. "We didn't execute well," center and captain Sam Mustipher said. "When you win in the fashion we did, we obviously weren't good enough." 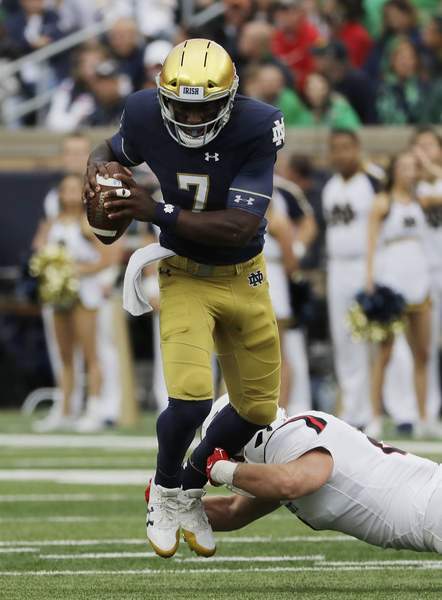 Wimbush hung in in the pocket and stepped into a number of throws with a defender baring down on him, but he also made several questionable decisions and tossed three interceptions. One went off receiver Miles Boykin's hands, but the other two were simply poor reads or poor throws. Wimbush took full responsibility for the miscues after the game and Kelly was coy about whether he considered putting backup Ian Book in the game. "I don't know that I'd tell you if I even thought of (going to Book)," Kelly said. "What we want Brandon Wimbush to do is continue to lead our offense. Brandon Wimbush wasn't the reason we were ineffective offensively. I don't think we coached very well this week, I don't think I prepared them the way we should have. We didn't protect (Wimbush) at the highest level. There's a lot of things." The Notre Dame defense wasn't perfect either, but it was good enough against an explosive Ball State team. Hyper-accurate Riley Neal – who went 23 for 30 in Week 1 – completed just 46 percent of his throws and the Cardinals averaged an anemic 3.6 yards per snap, despite running a whopping 97 plays (Notre Dame ran 72). Te'von Coney had a huge game with 14 tackles and cornerback Julian Love was a monster in the secondary, totaling eight tackles and batting away four passes. It's tough to fault a win, especially coming off such a resounding performance in Week 1. When Notre Dame looks back on this game at the end of the season, it should be remembered as a teachable moment: don't let down, but if you do, find a way to win anyway.